Leonardo da Vinci, a guide to websites, galleries, museums and places. The real-life landscape forming the background scenery of The Mona Lisa. A travel itinerary. Ultime pubblicazioni della Biblioteca Leonardiana. LI Lettura Vinciana. Le battaglie di Leonardo (Codice A, ff. 111r e 110v, ‘Modo di figurare una battaglia’). Leonardo da Vinci, background information. Facts about Leonardo da Vinci, whose innovations anticipated many of the developments of modern science. A biography in the Web Gallery of Art, a searchable image collection and database of European museums. Devices and Machines, Weapons and Warfare, Flying Machines. the castle where Leonardo da Vinci lived at the end of his life. A display of full-sized models of the “Fabulous Machines ” based on the designs of Da Vinci. Drawings of Leonardo Da Vinci, a virtual gallery. Galleries and art museums displaying works by Leonardo da Vinci. Leonardo da Vinci as scientist, inventor and artist. Milan. Leonardo da Vinci a Milano: visite guidate. Exhibition and catalogue of drawings by da Vinci, with images. a searchable database of European art museums holding works of art by Leonardo. 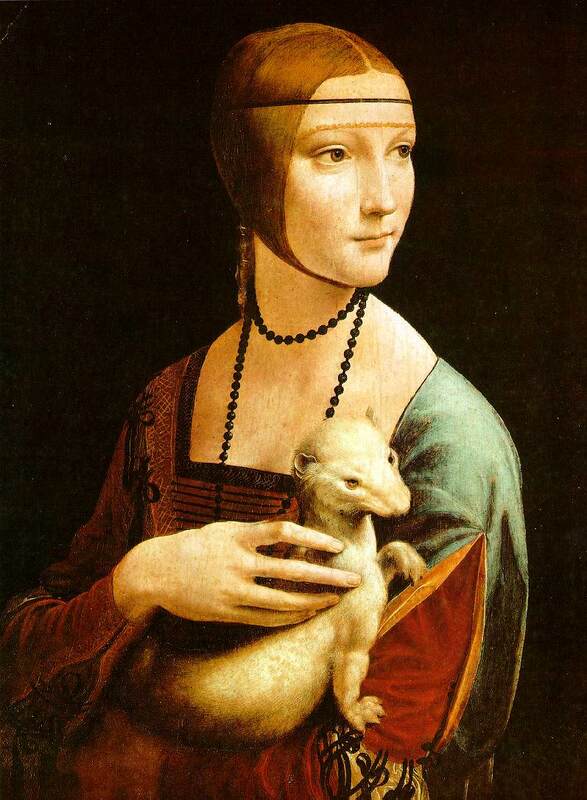 Leonardo da Vinci’s Lady with an Ermine. Louvre Museum Leonardo da Vinci collection. Metropolitan Museum of Art, New York, Leonardo da Vinci collection. ‘Leonardo da Vinci: Painter at the Court of Milan’ is the most complete display of Leonardo’s rare surviving paintings ever held. National Gallery, London, da Vinci collection. The Royal Collection of drawings by Leonardo da Vinci. Church and Convent of Santa Maria delle Grazie, Milan, home of The Last Supper (La Cena Ultima). Museums and galleries displaying works by Leonardo da Vinci. Leonardo da Vinci on the web page of the Italian National Museum of Science and Technology Leonardo da Vinci. Turning the Pages: High quality version of the Leonardo da Vinci notebooks. Paintings by Leonardo da Vinci (large reproductions). Wikipedia list of works of art by Leonardo da Vinci. High definition image of The Last Supper (16 billion pixels). Images for a Modern World. An evolving paper posted for discussion and entertainment, by Robert A. Baron. Images, Google map and Street View of Le Balze, Tuscany: rocks forming some of the landscape detail in The Mona Lisa, The Virgin of the Rocks and The Virgin and Child with St. Anne. Virgin of the Rocks; Wikipedia entry. Web Museum. Sketches and paintings by Leonardo da Vinci. Virgin of the Rocks by Leonardo da Vinci Le Louvre. Leonardo di ser Piero da Vinci, more commonly Leonardo da Vinci15 April 1452 – 2 May 1519), was an Italian polymath whose areas of interest included invention, painting, sculpting, architecture, science, music, mathematics, engineering, literature, anatomy, geology, astronomy, botany, writing, history, and cartography. He is widely considered one of the greatest painters of all time.